The exhibition is open tomorrow (Saturday) and Sunday 18 August. 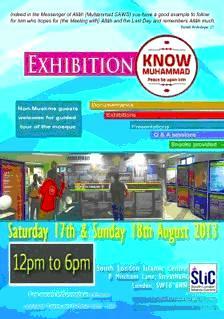 An exhibition entitled Know Muhammad is being shown in Streatham, south London this weekend. LBFN members and visitors are very welcome. A letter of invitation and further information from Mohammed Ijaz can be downloaded here. It is open on Saturday 17th and Sunday 18th August at 12- 6pm at Streatham Mosque, Mitcham Lane, Streatham SW16 6LY. Thanks to Alan Gadd at Faiths Together in Lambeth for passing the invitation on. Hustings at St James's Church, Piccadilly, organised by London Churches Group for Social Action, Evangelical Alliance and Faith to Engage on 18th April at 6pm. There are at least three hustings open to the public and hosted by religious or multifaith groups taking place in the lead up to the elections on Thursday 3rd May. Leave a comment if you know of others – particularly local events. Mayoral Candidates Boris Johnson, Ken Livingston, Brian Paddick & Jenny Jones at The Gourmet Theatre, Ruach Ministries, 197-199 Kilburn High Road, London NW6 7HY on Thursday 12th April at 6pm, organised by Operation Black Vote. GLA Candidates Jonathan Bartley, Rob Blackie, Michael Mitchell and Val Shawcross at Karibu Education Centre, 7 Gresham Road, Brixton, Sw9 7PH on Tuesday 17th April at 5.30 for 6pm, organised by Faiths Together in Clapham. Mayoral Candidates Boris Johnson, Ken Livingston, Brian Paddick & Jenny Jones at St James’s Church, 197 Piccadilly, W1J 9LL on Wednesday 18th April 6-8pm, organised by London Churches Group, Evangelical Alliance and Faith to Engage. A couple of excellent events coming up soon, organised by Faiths Together in Lambeth. The Lambeth Youth Faith Forum will be meeting on Sunday 11th March 4.30pm – 6.30pm, at the Karibu Education Centre, 7 Gresham Road, Brixton, SW9 7PH. Hussain Bapulah will introduce a debate about last August’s riots. Young people aged 16-22 are welcome – more information and booking details on the LYFF website (which also has a great photo-blog). Supported by Lambeth Council (Lambeth Green Community Champions) and the Skills Support Agency, an evening at the Jamyang Buddhist Centre, The Old Courthouse, 43 Renfrew Road, London SE11 4NA, on Thursday 22nd March at 6-8pm will include speakers from the Council, Transition Town Brixton, LIFE and others. For more information and booking details, download the flyer. Find the full listings of events during Inter Faith Week (20th – 26th November) at the IFW website, but here’s two which are of particular interest to us at LBFN, bringing local religious groups together with the public sector. Faiths Together in Lambeth and the Lambeth Safeguarding Board have got together to present Safe Activities and Safe Environments for Children on Monday 21st November at 5.30pm. Download the flyer here to find registration details – the evening includes a hot buffet and you will be particularly welcome if you live or work in Lambeth. Steve Miller and Karen Walkden shared their expertise with us on this subject last year and introduced us to the Safe Network‘s materials. The next evening (22nd November), in Battersea, the Wandsworth Community Empowerment Network celebrate 10 years of churches, mosques & temples working together to make sure that high quality public services reach the people who depend on them most – the theme is From Neighbourhood Renewal to the Big Society? Download the invitation here. People with an interest in co-production (our May meeting touched on this) will enjoy this event, which is open to locals and visitors alike. The guest speaker is Lord Maurice Glasman and will include a lively discussion on the future of social policy and community empowerment – plus plenty of good food! Download in an invitation here and register here. Would you like your Inter Faith Week event listed here? If so, please let me know asap.